The Vauth-Sagel Cornerstone Maxx quite literally turns the corner in cabinet storage design, providing a solution that allows full access to the cabinet contents without obstructing any adjacent cabinets. Vauth-Sagel have used intelligent design to recognise, address and provided a one-of-a-kind solution that meets modern living space demands, without compromising on quality or style. 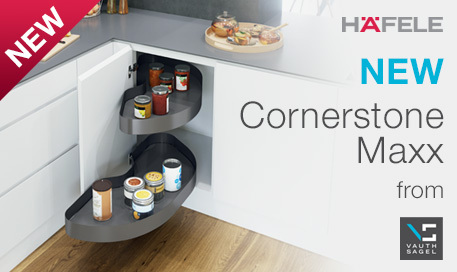 The Cornerstone Maxx, exclusively available through Häfele, transforms awkward corner space into an absolute storage asset. Large-area shelving has been designed to extend from the cabinet in a straight line, allowing for absolute convenience, without compromising access to neighbouring units. This innovative storage solution not only brings absolute convenience to the user, but also the fitter, with simple height adjustment even while installed and easy fit, toolless assembly. The baskets have power assisted movements in pull-out direction with a floating design due to hidden fastenings. The Vauth-Sagel Cornerstone Maxx is available, exclusively from Häfele NOW! For full details, please see here or read page 9 of What’s New: The Autumn Edit. COMING SOON! In keeping with the demand for colour of the moment, the Cornerstone Maxx will soon be available in Vauth Sagel’s unique and highly desirable lava grey finish, as well as with striking new Planero baskets. As part of their brand transformation, Vauth-Sagel have developed an internationally comprehensive rebrand, renaming their complete product range. 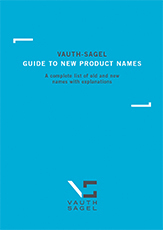 Find the new names for your favourite Vauth-Sagel products in our online guide now or request your copy now .